Saturday marks the 75th anniversary of the death of star Wallaby forward Kenelm “Mac” Ramsay aboard a Japanese Hell Ship in WW2. Ramsay perished with more than 1000 other Australians when the transport Montevideo Maru was torpedoed and sunk by an American submarine off Luzon, the Philippines on July 1, 1942. The big-hearted country boy from Quirindi, New South Wales had scored the only try for the Wallabies in the last pre-war Bledisloe Cup Test against the All Blacks. It would prove to be his last try. Kenelm Mackenzie (Mac) Ramsay – Wallaby #303 – was a victim of Australia’s greatest maritime catastrophe. Twice as many Australians (1053) died in this one incident than were killed in the entire Vietnam War. Significantly more were lost than in the sinking of the HMAS Sydney (645) and the hospital ship the Centaur (268). Yet few Australians have heard of the Montevideo Maru, the ghastly deaths of men and boys trapped in its burning hold or the painful, lonely legacy for generations of families seeking the truth and recognition for the victims. Ramsay was among 845 Australian soldiers and 208 civilians on the converted merchant vessel. It was a prison ship but the Montevideo Maru was one of such transports also referred to as Hell Ships for the atrocious conditions for prisoners jam-packed in their putrid holds. A member of the 1st Independent Company commandos sent to New Ireland in 1941, Ramsay had nearly escaped after the Japanese invaded that island and New Britain in early 1942 with a massive fleet fresh from Pearl Harbour. Their orders were to retreat south and stage guerilla attacks but Ramsay’s little escape craft was spotted, strafed and bombed. The survivors were interned at Rabaul, the pre-war capital of Australian-mandated New Guinea – until being put aboard the Montevideo Maru bound for Hainan Island as slave labourers. Fellow prisoners included the uncle of politician Kim Beazley, the grandfather of Midnight Oils singer-turned-politician Peter Garrett and the brother of one-time Australian Prime Minister Earle Page. The passenger list included teenagers and grandfathers, public servants and planters, missionaries, merchant seamen and Salvation Army bandsmen. The captain of the attacking submarine USS Sturgeon had no way of knowing allies were on board his target. For the majority trapped in the hold, the end was horrific as they were scalded and choked by oil, flames and seawater. The sole survivor of the Japanese crew described it to the ABC six decades later. “People were jumping into the water. Thick oil was spreading across the sea. There were loud noises… metal wrenching, furniture crashing, people screaming,” said Yoshiaka Yamaji. Yamaji told of spirit that sears the soul. A few Australians in the sea clinging to bits of firewood from their doomed vessel start singing. “I was particularly impressed when they began to sing Auld Lang Syne as a tribute to their dead colleagues. Ramsay was a versatile forward who played No.8, lock, flanker and prop. A product of Tamworth High School and Hawkesbury Agricultural College rugby, he played first grade for both Drummoyne (13 games) and Randwick (66 games) in Sydney. He scored 14 tries for Randwick and was part of their 1938 and 1940 grand final winning sides. In all Ramsay represented NSW 13 times. 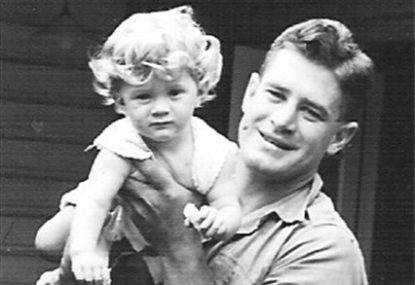 He toured New Zealand with the 1936 Wallabies and played in a Test against the Maori. He later represented Australia once against South Africa in Sydney (1937) and twice against New Zealand in Sydney (1938). That Third Test against the All Blacks at the SCG on the 13th of August in 1938 was a hard-fought loss in front of 20,000 people – and Ramsay scored the only Wallabies touchdown. There would have been more Tests if not for the war. 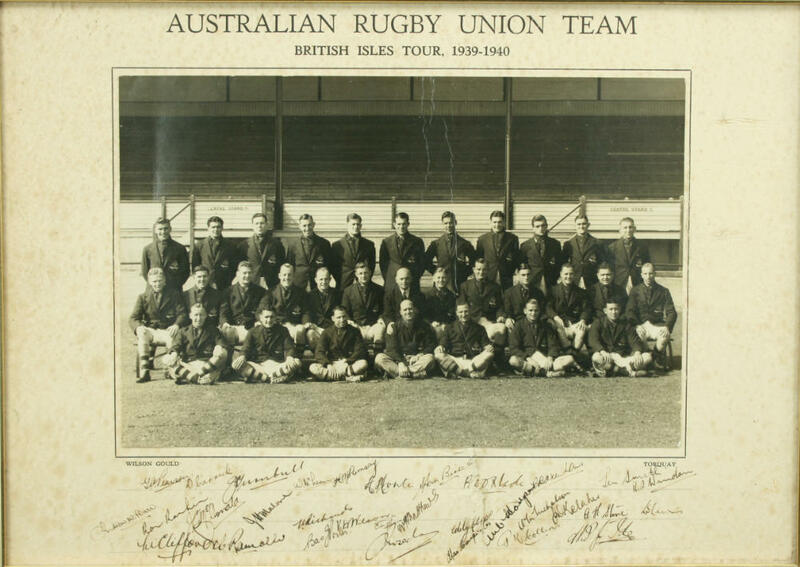 Ramsay was selected for what became “The Tour That Never Was – the 1939 Wallabies”. An enthusiastic former Australian Prime Minister Billy Hughes saw off the team. 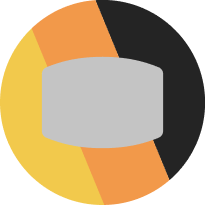 In team biographical notes, Ramsay was described as “the perfect team man”. A ten-month 28-match tour was planned but none of this was to be. The day after the Australians sailed into Plymouth Harbour, Britain declared war on Nazi Germany and all matches were cancelled as the nation flipped over into war mode. Before their ship back home was organised the Australians pitched in by filling sandbags for defences around the team lodgings – the Grand Hotel at Torquay. They were rewarded for this by having chauffeurs provided, who took them on a pub-crawl around the West Country. The team was also introduced to King George VI and his wife Queen Elizabeth at Buckingham Palace, where the captain Vay Wilson, a mathematics master, was introduced to the Queen as a “choirmaster”, to the great amusement of the Australians. A feature of the return journey was the erratic patch taken by their ship – constant “zig zagging” to avoid being lined up by any German submarine whose captain did not appreciate the finer points of rugby. Wallaby status was given to all the tourists. One of Ramsay’s Wallaby teammates was Winston “Blow” Ide, the son of a Japanese silk printer who settled in Australia in 1894. Sadly, Ide too would perish on a Hell Ship. He was taken prisoner in the Fall of Singapore and was been taken to work in Japanese coal mines aboard the Raduyo Maru when it also was sunk by American torpedoes. The last thing Ramsay did before embarking to New Guinea was visit his brother, sister-in-law and niece in their property in northern NSW. A poignant last photograph was taken of the family man with his niece. His family – and the families of the other men – spent nearly four years in painful, desperate limbo awaiting news of their loved ones after the fall of Rabaul and Kavieng. Even when news of the sinking of the Montevideo Maru emerged descendants spent decades tormented by official indifference, silence and inertia about the incident and who was actually on the ship. 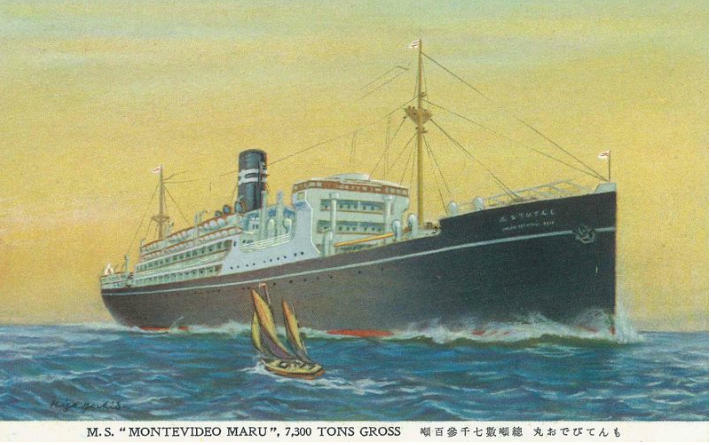 The Montevideo Maru seemed to be airbrushed from our national narrative. Finally in 2010 the Australian parliament expressed its regret to the families and in 2012 – the 70th anniversary of the sinking – a national memorial was unveiled at the Australian War Memorial. On Saturday, 250 people will take part in a 75th anniversary service at the war memorial. For Wallaby #303 “Mac” Ramsay and the other lost souls of the Montevideo Maru it’s important that the nation finally remembers.